U.S. Senate page Tori Miyagi was voted "Best Page" among 28 in Washington, D.C., who served 100 senators from September through January. 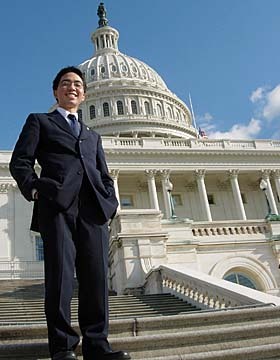 Sixteen-year-old Tori Miyagi's hard work paid off in his four months as a U.S. Senate page in winning three commendations. Miyagi was voted "Best Page" among 28 in Washington, D.C., who served 100 senators from September through January. He also won the Academic Award in Social Studies and was chosen speaker of his class, addressing a closing ceremony attended by several senators. Selected by Sen. Daniel Akaka to serve last fall, Miyagi said it was "an incredible learning experience." Miyagi was told by his supervisors that no Hawaii page has ever won any of the awards. The Hawaii Baptist Academy junior admitted, "I am not exactly the most normal child," in more ways than one. For example, he thinks the obsessive text messaging and video gaming among teenagers are "a waste of time," and he watches only the Discovery Health Channel on TV. His free time is spent volunteering at the Queen's Medical Center or the Pohai Nani Retirement Community. Miyagi is also president of the National Honor Society and the assistant drama director at his school. Miyagi made several friendships with other pages in spite of the cultural differences of being a Hawaii native: "It was fun; everybody had their little quirks." His quirks included bringing his own stash of wooden chopsticks from home because "all my meals are eaten with chopsticks -- they thought that was funny." Also, he said, "I kept wanting to take off my shoes." Miyagi met Sens. Barack Obama, Hillary Clinton and others running for president: "They're all very nice people no matter what the papers say. But I wasn't in awe of them. I mean, they're special and powerful, but they're just people like you and me."